Part 3 - Where do sculpture ideas come from? The first animation convinced me that this was worth pursuing further. The next step was to add some reality by tying the wheel parts together and adding a simple circular base to hold them to the wall. I redid the wheel drawing in Illustrator and the changes (shown in blue above) were automatically brought into After Effects with the centers aligned. The difference in the animation is subtle. A new pattern has emerged in the center of the sculpture that overlays the initial pattern. This is what draws my eye now. Note: The blue coloring is only in the drawing to show changes, the animation shows them in the same "wood" color. Newer PostPart 4 - Where do sculpture ideas come from? 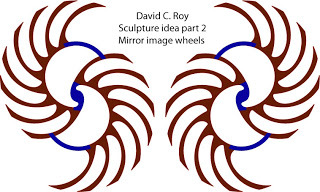 Older PostPart 2 - Where do sculpture ideas come from?